Doug Boyd, Mimi Rothman, Anna Kubiak and Ashley Hill with Maria Rasmussen and Memorable. 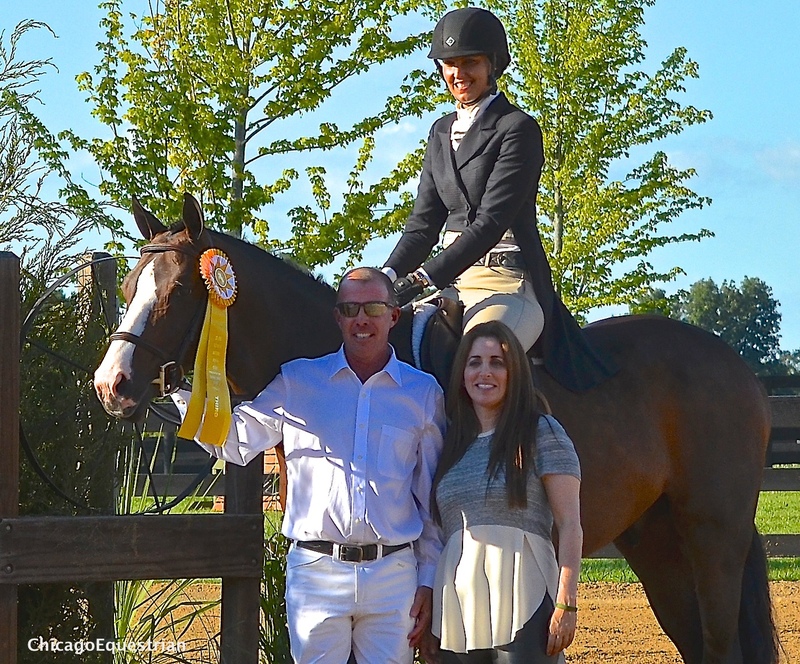 Antioch, IL – September 6, 2014 – The $5,000 USHJA National Hunter Derby was the highlight of the day at the Chicago Hunter Derby presented by Chicago Equestrians for a Cause. Graciously sponsored by Sapphire Riding Academy in Mettawa, IL, riders and spectators enjoyed a delicious lunch as almost 40 horse and rider combinations competed for the top honors. 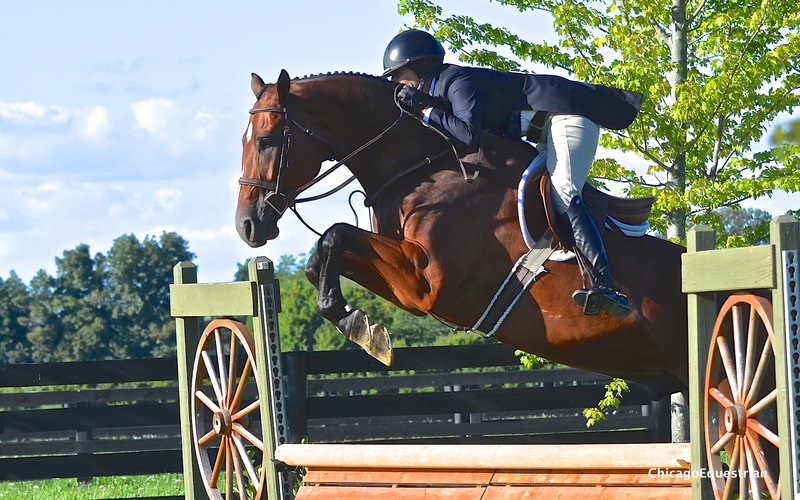 The Chicago Hunter Derby is a premier stand-alone event, which also raises funds for charities. Three charities will benefit this year; the USHJA Foundation, the University of Chicago Cancer Research Foundation and Ann & Robert H. Lurie Children’s Hospital of Chicago. Exhibitors and show management agreed to make a slight change in the location of the course due to the large amount of rain from the past few days. Fortunately, Annali-Brookwood Farm has plenty of acreage and fantastic amenities to support the event. Course designer Bobby Murphy and his crew redesigned a course for the sand ring and rebuilt the track in order to save the footing in the beautiful grass field for the $50,000 USHJA International Hunter Derby which takes place on Sunday. The track for the first round was only in the sand ring with natural looking brush jumps, gates and cord wood walls. For the handy round, riders jumped out of the ring into the grass to jump a coop option jump, a trot jump on a knoll, roll back to an oxer and jump back into the ring to finish over two more jumps. As the scores rolled in from judges Ken Smith, Jeff Wirthman, Julie Winkel and Holly Orlando, the list of the top 12 horses took shape. In addition, announcer Brian Lookabill kept the crowd going with the Score 90 Challenge. Barns and businesses have made pledges for scores of 90 or above. Each time a horse earns a 90, a bell rings and more money is raised for the charities. Today’s top riders earned the charities $3,120 thanks to pledges made by Lynn Jayne’s Our Day Farm, Brookwood Farm, Telluride Farm, Integrity Farm, Ann K Hubbards and Meadow View Farm. Maria Rasmussen and Memorable, owned by Over Fences Farm, had the most memorable rounds to the judges today earning the lead in round one with 183.25 and holding the lead in the handy with scores of 89 and 86 for a total score of 366.25 for the win. Rasmussen has been riding the six-year-old warmblood since February and shows it in the Pre-Green division while young rider Anna Kubiak shows it in the Children’s Hunter Division. Maria Rasmussen and Memorable earned the charities $1,040 in the Score 90 Challenge. Tammy Provost with Asscher, owned by Provost and Wendy Hofmeister, was just .25 behind Rasmussen in the first round with a score of 183. But Provost held on to her second place spot as well, earning 168.5 for a total of 351.5. 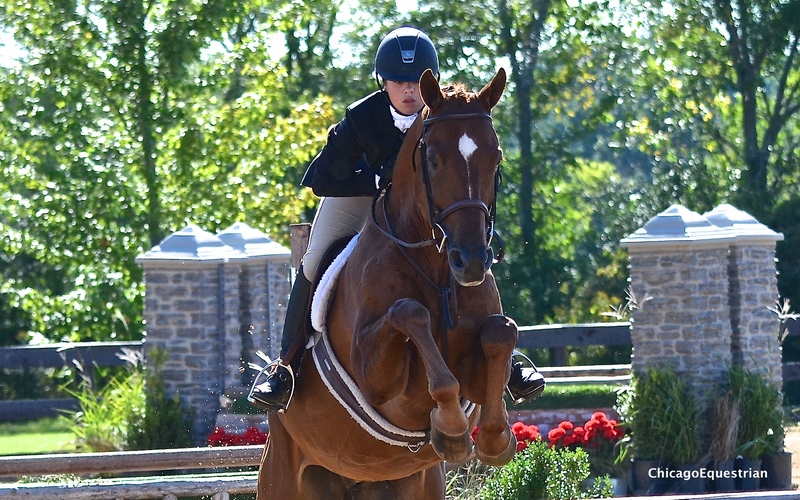 Tammy Provost and Asscher took second place in the USHJA National Hunter Derby. Provost of Sheridan, IN, has been coming to the Chicago Hunter Derby since it began and she continues to bring more horses every year, this year bringing eleven. Her mount Asscher, a Popeye K baby, has had a great Pre-Green season, winning multiple championships, classics and incentive classes. The ride of the day had to go to Molly McAdow and Lanie Bricker’s Charlie Brown, who scored a 169 in the first round, returning in twelfth place, only to gallop their way to the third place finish overall with two 87’s and an overall total of 351. Molly McAdow and Charlie Brown came from behind for third place in the Chicago Hunter Derby's USHJA National Derby. Several special awards were handed out today. Nicole Loochtan of Hawthorn Woods, IL, and her Hanoverian gelding, Dream On, earned the Top Junior Award for the highest scoring Junior rider and finished in twelfth place overall. 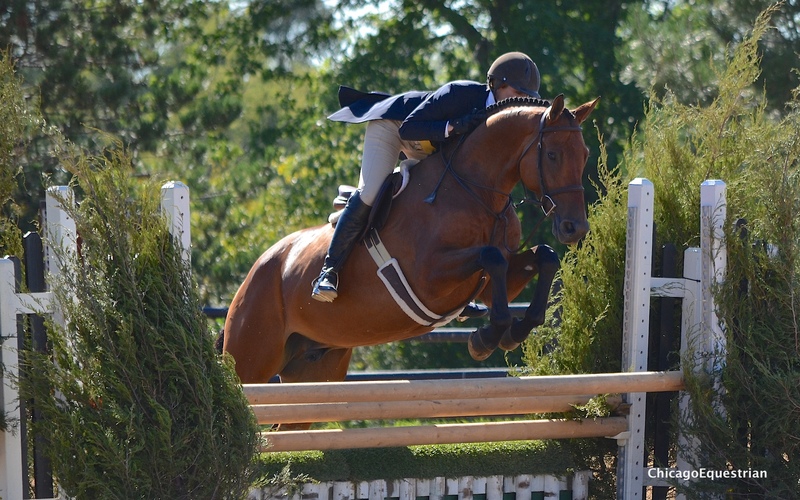 Loochtan shows in the Junior Hunter division and also owns a jumper, In Your Dreams. Katie Hochschild and Sailor’s Delight won the LeFash Ride in Style Award for the Best Turned Out Horse and Rider. 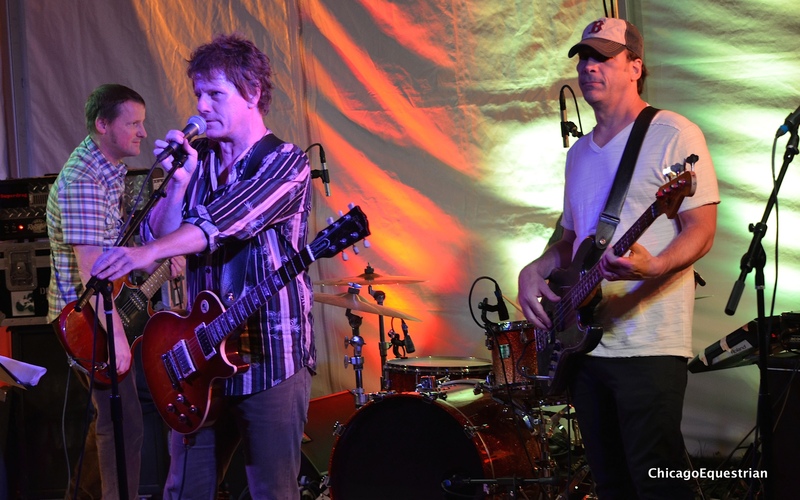 The band blitzFM at the Derby After Dark Party. The day wrapped up with the Derby After Dark Party featuring the band blitzFM along with tasty Mexican food by Paramount Events, an open bar sponsored by Constellation Brands and a special Bourbon bar by Ange’ls Envy. Competition continues Sunday with the $50,000 USHJA International Hunter Derby sponsored by Canadian Pacific. The first round begins at 8:30 am and the final round is scheduled for 1:00 pm. The day is packed full of events for the whole family including a petting zoo, face painting and a horseless horse show sponsored by Rice Dairy. Vendor Row is filled with great equestrian inspired shopping including silent auction and raffle items to benefit the charities. A delicious champagne brunch will be served and a Calcutta will keep spectators cheering for their riders. Annali-Brookwood Farm is located at 18752 Edwards Road, Antioch, IL 60002.